I am a huge fan of Jurlique and am obsessed with their Rosewater Balancing mist and back in December they opened their very first UK Store here in London and I went to that opening which you can read about here. This time I was back in store for a facial which I was really looking forward to after a stressful working week and of course, it is a real treat on a Friday. 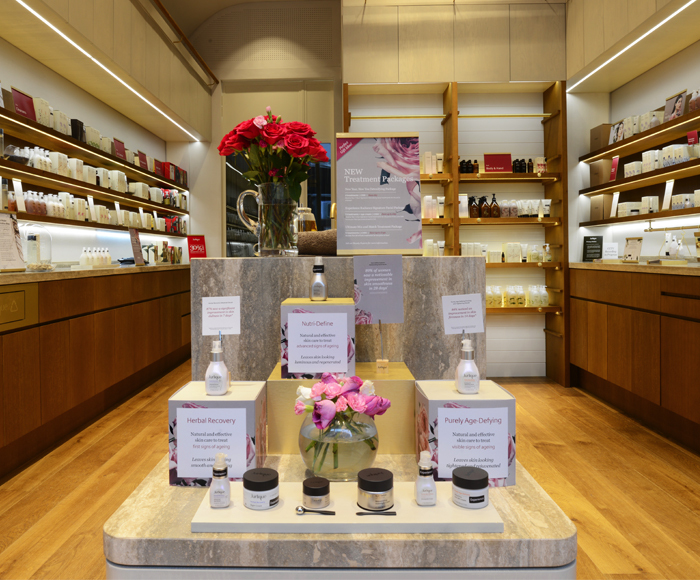 Inside the store, it is incredibly calm and serene, so much so that you actually forget you are in on one of the busiest streets in London and are right in the heart of shopping heaven. Inside the store, the girls who work there are just divine knowledgeable, warm and friendly. Having been offered a lovely freshly brewed peppermint tea, I was taken through to the treatment room to familiarise myself with the surroundings, take a deep breath, sit back and relax. Then after a quick questionnaire about your skin and your main concerns, your therapist will then go through the treatment with you and at any point, you can and should ask any questions that you may have. The signature facial lasts an hour and it is one which is customised to your skincare concerns, hence the questionnaire. Then it is time to remove some clothing, only the top half, climb onto the bed and lay down all comfortable under a huge towel, a warm blanket and then if you are a little chilly there is the option of an electric blanket too. The bed is the comfiest I have laid on, there is a perfect curve so your back isn't flat out. My hair was covered with a muslin cloth so there would be no transfer of products and having chosen my signature blend of oil, which in my case was the Balancing Blend Essential oil which is used to create a sense of balance and harmony. As the facial begins a professional cleanse and a warm compression is used as this deeply cleanses the skin and boosts micro-circulation. My cleanse started with Replenishing Foaming Cleanser which is perfect for dry skin and it lifts away surface impurities leaving the complexion fresh and clean. Then as the massage began, I was almost ready to drift off as the relaxing and calming music in the background was simply incredible. My face was massaged to stimulate the lymph, plump the face and generally give my whole face a good work out, it wasn't at anytime uncomfortable, in fact, it was just heavenly. I was also given the option of steam which helps to unclog and cleanse your pores, enhance circulation and just remove anything clinging to the skin. My eyes were covered with a warm, slightly damp towel and as the steam was sprayed over my face, it was a lovely gentle burst of heat. My skin was then exfoliated using the Daily Exfoliating Cream which is a non-granular exfoliating cream making it perfect for everyday use and it cleans deeply to lift away dead skin cells leaving skin smooth and radiant. As the products are used on your skin and you are relaxed a neck and shoulder massage also takes place and again this is just so incredibly heavenly, especially if like me, stress seems to settle itself on your shoulders and across the back area, anything that helps relieve those knots gets a thumbs up. Then as my face mask was applied I was treated to a hand and arm exfoliation which also comes with a further massage and sometimes there is nothing more delightful and soothing than a hand massage. The treatment was finished with a little Rose Silk Finishing Powder which is a silky translucent facial powder that refines the complexion and helps reduce unwanted shine giving the skin a matte finish. Then finally came the Rose Love Balm for the lips and this is a natural balm that is infused with the natural scent of roses. On the lips, it helps to moisturise, soften and protect dry or chapped skin but can also be used on the cuticles, dry skin and essentially as a multi-use product. As you can imagine, I felt incredible after this facial. My face and skin had been through a proper workout and I was now glowing. After I had dressed and gathered my belongings, time was taken to go through each product which was used, the reason for using it and some little advice and tips with continuing skin care. The Jurlique Signature facial at the Jurlique Boutique costs £65.00 and I more than recommend it whether or not you are a fan of the products if you have never tried them if you are curious about the products and so on. Not only do you get an incredible facial, but you also get an education in your own skin, time to relax, a full facial work out, the pleasure of being pampered and an hour of uninterrupted your time. This sounds so relaxing! I love it when treatments are customised for you. I ave their re-balancing mist and it's so good! This looks like the perfect treat though!! And it's probably very relaxing! This treatment sounds heavenly. I love the mist, it's so refreshing and the scent is beautiful. I hope they open more stores in the UK so I can give this a go. I love the look of the store, and it sounds so lovely too! I love their mist too! Good thing they have a new store opened. I'll try to visit the it so I can look for other items that might suit on me. This sounds so lovely. I really like Jurlique skincare.